Detailed Project Report to connect Raidurg and international airport at Shamshabad is in the final stage. Hyderabad: In the final stage of Phase – II express connectivity to be made viable between Raidurg and international airport at Shamshabad. This is as per the Detailed Project Report (DPR) of the Hyderabad Metro for second phase. The DPR will be prepared by the Delhi Metro Rail Corporation Limited (DMRC) and they are expected to submit the report soon. 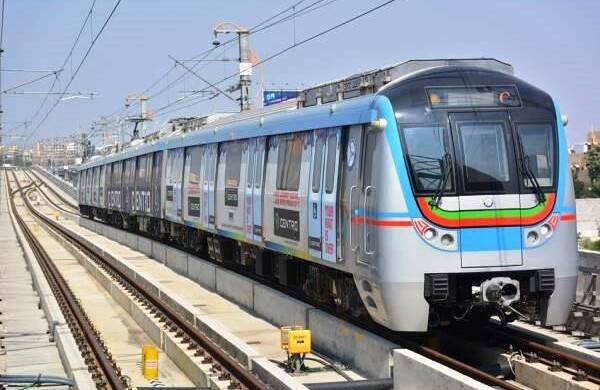 Managing Director, NVS Reddy of Hyderabad Metro Rail Limited (HMRL) while speaking to the press said that they had an internal discussion and then DPR will be sent to state government for getting nod. The second phase will also include development of other Hyderabad Metro stretches; this apart from offering metro express connectivity to airport. Reddy while talking The New India Express stated that HMRL under Phase-II has proposed to take up other routes from BHEL-Lakdikapul corridor via Kondapur, Gachibowli, Shaikpet, Tolichowki, Mehidipatnam and to connect the gap between LB Nagar and Nagole, Falaknuma to Shamshabad airport. Further by 2019, phase-I of metro that covers 72km stretch will be completed barring Old City stretch. L&T Metro Rail (Hyderabad) Limited is expected spend an extra Rs 2,500 crore to wrap up the Hyderabad Metro Rail project. As a concessionaire, LTMRHL has spent around Rs 13,000 crore of the Rs 14,132 crore taken up under public-private partnership. While the State government has offered nearly Rs 2,300 crore for acquiring land, right of way and connected infrastructure ensuring timely completion of the project. HMRL has already conducted survey and marked properties lying in metro stretch. L&T Metro Rail (Hyderabad) Limited MD & CEO, KVB Reddy assured that Hyderabad Metro work in on track. He further added that they have managed to use best of technologies to implement the project successfully with the help of HMRL. There were few glitches and challenges but together both HMRL and L&T Metro Rail (Hyderabad) Limited managed to overcome them.